When the spine curves sideways, physicians call this condition scoliosis. Scoliosis can cause intense stiffness and pain. It is considered an idiopathic condition because there is no known cause of the condition. We see this condition in more women than men, and in many instances it begins during a person’s childhood. Unfortunately, when the condition is not diagnosed in the beginning stages, it can become progressively worse. The good news is that scoliosis chiropractic therapy may help improve a patient’s condition without dangerous surgery. The word ‘Scoliosis’ comes from the Greek word for ‘curvature’. Patients who have this condition have an ‘S’ or ‘C’ shaped curve to their spine. The vertebrae in the spine rotate and a hump is noticeable near the patient’s mid-chest area. A curve that is 60 degrees or more is a severe diagnosis, and it can cause a person to have improper balance. 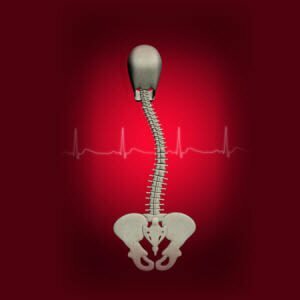 Although improving your posture will not eliminate scoliosis, scoliosis chiropractic therapy, combined with lifestyle changes, may help make the condition more manageable. Even though there are no definitive causes of scoliosis, there are theories that some disorders and ailments can place a person at a higher risk of getting the disorder. Degenerative diseases such as osteoporosis can cause the vertebrae to become soft. As the bones soften, they are more susceptible to scoliosis. Once the vertebrae begin to bend, the spine begins to curve. This is evident by rounding of the back that is seen in osteoporosis patients. Without proper treatment, the patient may begin to experience other symptoms such as severe back pain and problems breathing. A chiropractor will begin assessing your condition by taking a look at how healthy you are overall. The chiropractor will also ask you questions about your family history, any past or recent injuries and any symptoms you may have. Chiropractors use x-rays, neurological tests and orthopedic tests to determine the extent of your condition. The chiropractor may also measure your legs’ length to check for unevenness. Chiropractors administer range of motion tests to determine the amount of mobility you have. Making regular scoliosis chiropractic therapy appointments will allow the chiropractor to monitor your condition. Physical therapy along with other treatments can minimize symptoms and help restore normal function. Dr. Renee White of Champion Chiropractic specializes in back pain, neck pain and other health ailments related to the nervous system and spinal column. If you are suffering with scoliosis, back pain, headaches or injuries from an auto accident, make an appointment today.